I boss myself and set my own work schedule so I celebrate my birthday with a solo hike or ride. With all the snow around and the temperatures below freezing at dawn, I chose to ride Camden Hills State Park this year. Refrozen snow is good. Thawing snow isn’t, for biking that is. Whenever I go out on a hike or ride, I hope to notice something interesting. Today it was connecting shade and north slope conditions with good solid track to ride upon. The Camden Hill State Park is a 10 minute drive away. I started up the mile long climb on fairly packed surface- many folks walk this section, some with their dogs, and it shows. Eventually I reached the left tun for Bald Rock Mountain, a 1,000 prominence that overlooks the Atlantic. It has been deep enough with snow that snowmobiles have gone to the top yesterday. None up there today. I am trying to make the full 5 miles on this Multipurpose Trail and then turn around and come back. I am racing sunshine, which has the capacity to soften the surface of the trail and cause my 5” tires to sink in and wallow. In the next mile, the Multipurpose Road flattens out and is bordered by hemlocks and spruce trees that not only shade the surface from the sun, but hold the cold overnight. Grip is better here. Soon I encounter the right tun for the Summer Bypass Trail, left untouched all winter. You can see that entrance right above the top of my front tire. At the 2.5 mile mark I reach the Ski Shelter, empty this morning. I will enter on my way back and drink water and eat a snack. Still pushing to preserve firm snow. From this point to the Route 1 side of the Park, there is much less foot traffic , with a clean snowmobile track from a rider who probably came through here last night or early this AM. I stopped just at the water tower, turned around, and came back, deciding to take a left up the Cameron Mountain Trail, a decision which was aided by fresh snowmobile tracks and two sets of foot prints going that way. Cameron Mountain is at the very edge of the State Park. The snowmobile track swoops around the summit and then twists and descends through private property when it eventually crosses Youngstown Road and heads for Lincolnville Center. The down hill is steep and fast, but my Ice Cream Truck embraces the wobble and delivers. I decide to continue on the snowmobile trail rather than ride the pavement of Youngtown Road back to the car. I discover a huge hay field where I thought that I had lost the trail, but then I saw a tiny red trail sign far across the center of the field. Winding my way down toward the village, I encountered an active logging operation that I was able to ride through with little difficulty. After more than two hours of pedaling, I decided to get a breakfast sandwich and a coffee at Drake’s corner store where I took this distorted selfie in the window. My car was still three miles away. I do not like riding on Rt. 173, due to the narrow road and inattentive drivers, so I decided to gamble on the abandoned section of Thurlow Road being tracked in. After dodging thinly iced-over water at the start, I encountered unbroken soft snow as far as I could see. I decided to walk the bike through. I was tiring, with my heart rate spiking to 155 beats per minute through the snow. Soon I encountered a little maple sugaring operation half way through service via a couple of ATV ruts that assisted me getting back to better track. A sort while later I was back on pavement, where I took a left on Youngtown Rd. and had a leisurely couple of miles on pavement back to my car and home. Today was a great start to my next season of exploring my local trails. 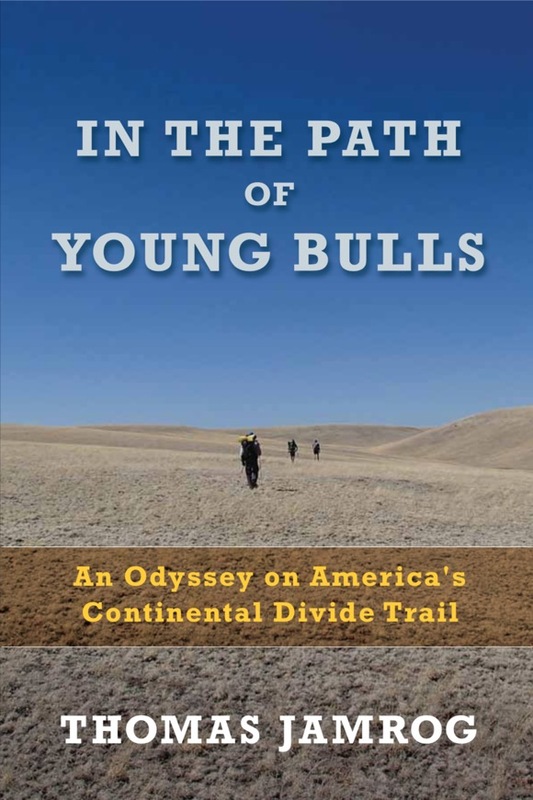 Tom Jamrog will present on Thursday, February 1 at 6:30 PM on his 5 months of experiences on the CDT, one of the toughest long distance hikes in the world. The 2,500 mile National Scenic Trail is now 70% completed. It starts at the Mexico border and travels along the spine of the Rockies as it winds through New Mexico, Colorado, Montana, Wyoming, and Montana into Canada. 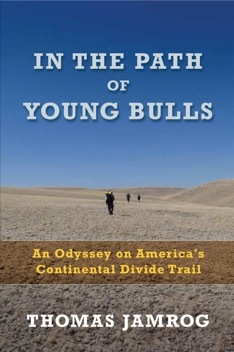 The presentation will draw on images and stories from his newly released book: In the Path of Young Bulls: An Odyssey Along America’s Continental Divide Trail. Blue Hill Books will assist with book sales at the event.